A Knight’s Tale was released in 2001 by Columbia Pictures and was directed by Brian Helgeland. Although not based on any recent work, its title references Geoffrey Chaucer’s The Knight’s Tale. According to Variety.com, the film takes place circa 1360. This is reasonable, as jousting became an especially popular sport in the fourteenth century. 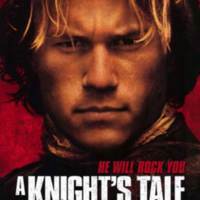 A Knight’s Tale follows the story of William Thatcher (Heath Ledger), a squire to a Sir Ector (Nick Brimble). Sir Ector passes away moments before he is due to joust in a tournament, so William puts on his armor, pretends to be him, and ends up winning the tournament. His success inspires him to create a fake identity for himself, that of Sir Ulrich von Liechenstein, and to continue competing in tournaments. His fellow squires, Wat (Alan Tudyk) and Roland (Mark Addy), along with Geoffrey Chaucer (Paul Bettany), help him keep up the ruse. When William meets the lovely Lady Jocelyn (Shannyn Sossamon), he is determined to win her heart, despite the efforts of his rival Count Adhemar (Rufus Sewell), who is also vying for her attention. The movie is a quintessential rags-to-riches story, all about changing one’s destiny even when there are considerable social and economic obstacles. In the film, young William’s father tells him that any man can “change his stars” if only he were to try hard enough. This is a crucial recurring theme, because William rises from his social status, from mere squire to a knight. How plausible was it really that someone of peasant stock, like William, could rise to become a knight? David Herlihy, in his article “Three Patterns of Social Mobility in Medieval History,” discussed social mobility in the later medieval era, refuting the notion that social advancement was impossible. He stated that current research has revised previous ideas about social mobility in the medieval period (Herlihy, 625), and he provided a variety of examples (Herlihy, 624). And there are even tales of sons of knights, such as the Hauteville brothers, who eventually created a dynasty. They worked as mercenaries, castle administrators and eventually rulers (Herlihy, 639). In the movie, William lies about his lineage to gain entrance into a jousting tournament. He proves his worth as a strong knight in many tournaments and, as we are shown, through his honorable actions. Eventually, Prince Edward knights William. While this plot line may have stretched the truth a little, it is in line with modern research on social mobility in the middle ages. A Knight’s Tale is interpreting modern research on social mobility in the late middle ages and translating it into a story that audiences understand. The use of anachronism in A Knight’s Tale is not by mistake. Helgeland used anachronism to convey to the modern audience the different social hierarchies represented in the movie. For example, one of the very first scenes in the movie is that of a crowd of ordinary folk preparing to watch a joust. The soundtrack? Queen’s “We Will Rock You.” Nicholas Haydock discussed how the crowd responds to the joust and the music; singing along, stomping their feet, taking off their shirts (Haydock, 102). This reminds modern audiences of today’s sporting events. This kind of anachronism signals to the modern audience that, just like today, these kind of sporting events were spectacles of excitement for everyone. Another example of anachronism is during a dancing scene between William and Lady Jocelyn, a seemingly “medieval” song begins to play, when it transitions into David Bowie’s “Golden Years.” Again, the music is reminding the modern audience that dancing and music produced just as much excitement then as it does now, for any social group. Haydock reminds us that these kinds of anachronisms are part of the recreation of the middle ages, not meant to be entirely historically accurate. But A Knight’s Tale uses medieval stories, ideals, and events in order to tell a modern story of love, hard work and determination. The anachronisms in the movie only add to the modern understanding of medieval people of all social stations, so that we as an audience might better relate to them. The characterization of Lady Jocelyn, the romantic interest, provides valuable insights as to how the film blends modern feminism while also subverting medieval literary tropes. 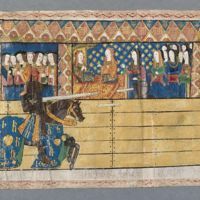 In her essay, “A Hard Day’s Knights: First Knight, A Knight’s Tale and Black Knight,” author Caroline Jewers argues that Jocelyn emulates the character of Guinevere when she demands that William lose a jousting tournament, like Lancelot did in Chavalier de la Charrette (Jewers, 200). It follows an Arthurian plot line, but this kind of flirting might be recognizable to modern women. Jocelyn is teasing William and testing his loyalty, not begging for his affection. Jocelyn also speaks her mind about other issues of gender, like when she asks, “Why must everything be run on a man’s schedule?” – echoing modern sentiments that question a patriarchal society. Comparing Jocelyn to the other central female character, Kate the Blacksmith, we also see other concessions made to modern feminism. Kate defies the stereotype set out for her as a medieval woman by choosing to be a blacksmith. The movie does not portray her as “manly” either, she appears feminine and even teaches William traditional courtly dances. But she knows she can do better work than any other blacksmith, despite her gender. This characterization may speak to the struggle that woman have gone through to be recognized as equals in the workplace. These two women, while representative of certain medieval ideals, can be seen as feminist characters. I found A Knight’s Tale to be entertaining, comical, and was a great addition to Heath Ledger’s body of work. He was an actor who had a breadth of diverse roles, and the role of William Thatcher was no different. A Knight’s Tale, through its use of anachronism, highlights the social divisions and gender hierarchies of the medieval world in an interesting, modern way. While A Knight’s Tale takes no more than the title from Geoffrey Chaucer’s The Knight’s Tale, we see Chaucer’s flair for words reflected in some speeches and the overall dramatic arc of the movie. A Knight’s Tale has earned its rightful place in the collection of great “medieval” films. Herlihy, David. "Three Patterns of Social Mobility in Medieval History." The Journal of Interdisciplinary History 3, no. 4 (1973): 623-47. Normington, Katie. "‘Faming of the Shrews’: Medieval Drama and Feminist Approaches." The Yearbook of English Studies 43 (2013): 105-20. Haydock, Nickolas. The Imaginary Middle Ages: Movie Medievalism. Jefferson: McFarland & Company, Inc., 2008. Jewers, Caroline. “Hard Day’s Knights: First Knight, A Knight’s Tale and Black Knight.” In The Medieval Hero On Screen: Representations from Beowulf to Buffy, edited by Ray Driver, 192-210. Jefferson: McFarland and Company, 2004. 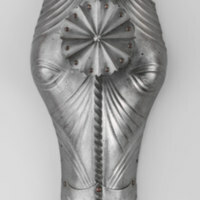 "Blind" Shaffron, a horse's head defense, for a Joust (c. 1490), from Metropolitan Museum of Art.